Claude Monet, some of the La Vallée de la Creuse series (1889). WikiArt. In the first article of this series, I showed what I mean by series paintings, defined some sub-types, and considered how and when they came about. 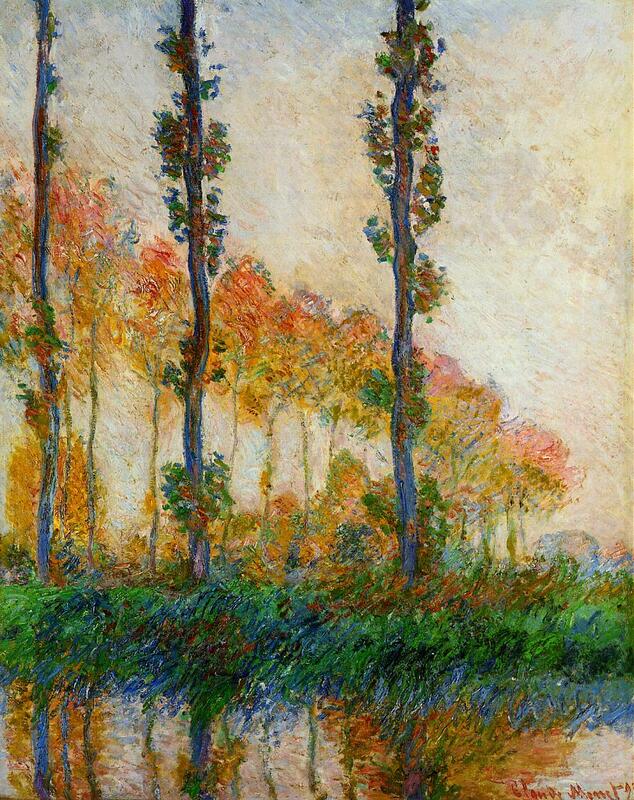 The second article then examined Pissarro’s series paintings, and the third those of Sisley. This article considers Claude Monet’s series paintings: how they developed, which major series he produced, and what he intended by painting them. Throughout this I will refer to his paintings by approximate title (italicised) and their number in the Wildenstein catalogue raisoné, for example W123. From some of the earliest paintings in his long career, Monet made two or more representations of the same motif. For instance, in 1864, he painted two very similar versions of La Rue de la Bavolle, à Honfleur (W33, W34), and three very similar versions of another view at Honfleur (W37, W38, and W51). It is also worth noting that in 1865 he painted his first Grainstack, although on that occasion a singleton. He painted three identical compositions of a view of Le pont du chemin de fer, Argenteuil, in W318, W319, and W320, in 1874, where the differences were mainly in the movable elements (boats, trains) and light. The following year he reached a group of four, although this time there were changes in composition too, in Red Boats at Argenteuil (W368, W369, W370, W371). It has been suggested that his famous paintings of the Gare Saint-Lazaire (1877) should be considered as a series, but they differ greatly from one another and I would prefer to think of them as a set or group, not a series in my sense of the term. In 1878, his first possibly loose series started to appear, with Branches of the Seine at Vétheuil (W481, W481a, W482, W483, W484), but there are slight changes of view, as well as different effects of light. 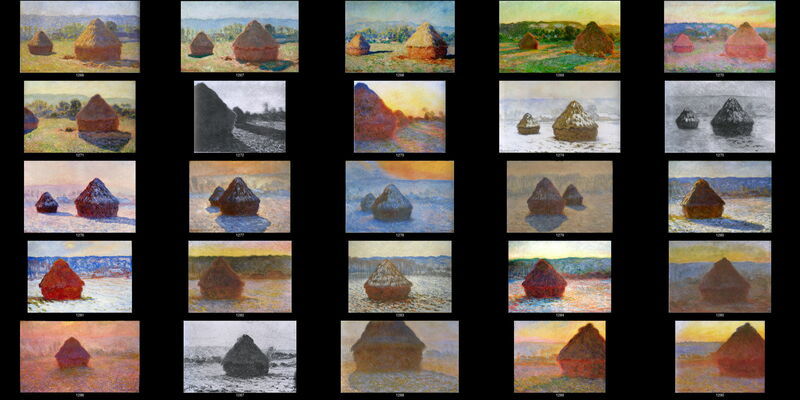 Closer matches exist between paintings of the Banks of the Seine at Lavacourt, in summer (W495, W496, W497, W498, W499) and winter (W513, W514), painted in 1878-9. The following year he assembled a further loose series showing the Breakup of ice at Vétheuil, in W565, W566, W567, W568, W569, W570, and W571. Another suggested early series is that of the Cabane des Douaniers of 1882, but I can only see four branches, of 2-4 works each, making a total of 13 (W731 to W743), which could be coincidence rather than a series as I have defined. There is no doubt, though, that his paintings of Pourville in the same year amount to a series with two branches, one consisting of W776 to W782, the other W783 to W786, a total of 13 again. Claude Monet, some of the first Pourville series (1882). WikiArt. Monet painted several views of the Manneporte in 1882, but I cannot see any real series among them, and in 1884 painted his second Grainstacks, just 3 canvases at that time. A different three Grainstacks were painted in 1885 (W993 to W995), which were unusual in including figures. Monet returned to the Manneporte at Étretat in 1885-6, and completed a loose branched series; one of its four branches consists of six canvases, W1014, W1014a, W1015, W1015a, W1044, and W1045, but the other branches are much smaller in number, making 13 paintings in all. 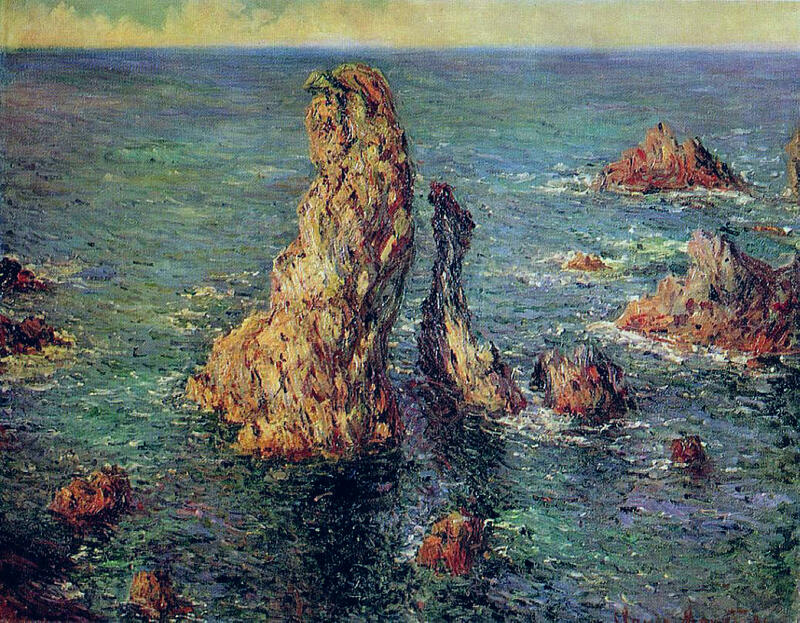 Claude Monet, some of paintings in the “Manneporte” series at Étretat, painted in 1885-6. Wildenstein catalogue numbers are given. Later in 1886 he completed a short series of the Pyramides de Port-Coton (6 paintings, W1084 to W1089), and three smaller groups at Belle-Île. This was followed in 1888 by a series of 6 paintings of Antibes (W1158, W1159, W1160, W1161, W1161a, W1163), and in 1888-9 by 6 more Grainstacks, W1213 to W1217 and W1217a, the last being sadly destroyed by fire later. Claude Monet, Pyramides de Porte-Coton (1886) W1085, oil on canvas, 65 x 81 cm, Private collection. WikiArt. 1896, La Seine, 4 paintings W1435 to W1437, and 17 paintings W1472 to W1488. Various Venetian series, including the Palazzo Dario, and the Grand Canal and Santa Maria della Salute. 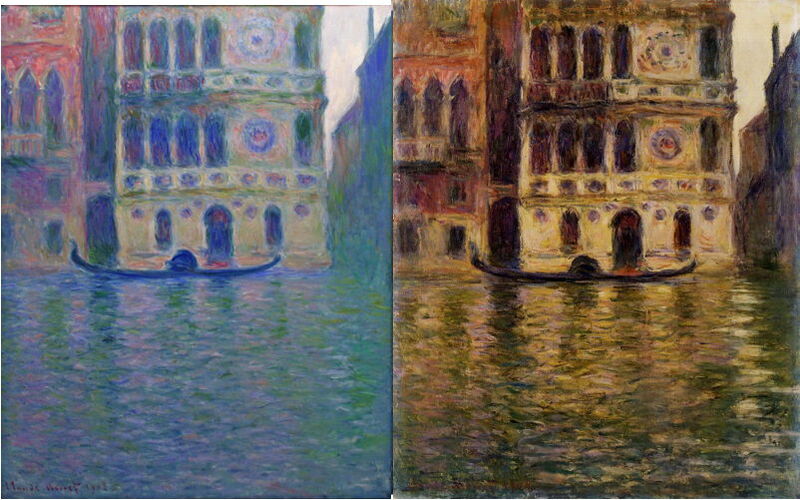 Claude Monet, two paintings from the Palazzo Dario series (1908) which appear to resemble one another too much to have been painted on separate occasions. WikiArt. I think that it is fair to say that, as shown in the catalogue numbers above, in the period 1890 to 1897, Monet painted few works which were not part of a series, and after 1896, almost all his paintings were in series. It is clear that Monet was, intentionally or not, painting loose series well before the exhibition in May 1891 made his Grainstacks series so famous, and well before the even better planned Rouen Cathedral series of 1892-4. However neither he nor his major dealer, Durand-Ruel, had made any particular fuss about previous series, nor do I believe that they were exhibited as series, at least not until long after Monet’s death. Why did this change? 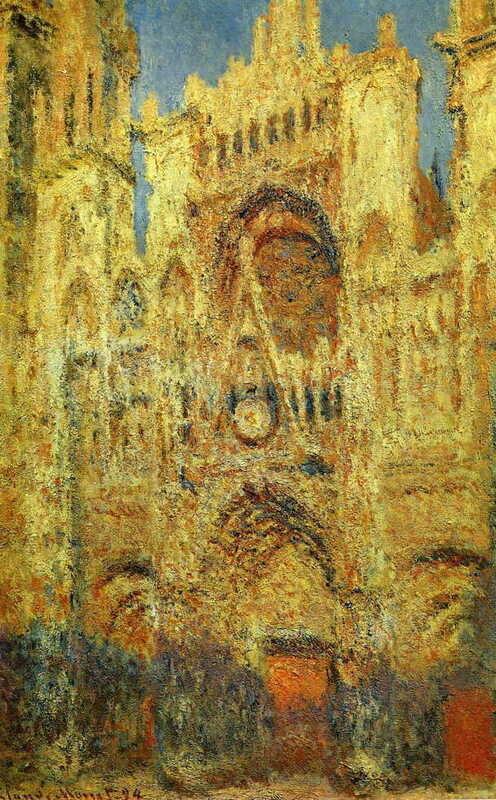 Claude Monet, La Cathédrale de Rouen (1894) W1326, oil on canvas, 100 x 65 cm, Pushkin Museum, Moscow. WikiArt. I think the answer lies in the crisis that Monet and Monetian Impressionism was going through in the later 1880s. Suddenly Neo-Impressionism (Divisionism), with its claim to a ‘more scientific basis’ and spectacular paintings by Signac, Seurat, and Pissarro, had stolen the limelight. Monet was no longer in the lead of the avant garde, and had to respond. His response was extremely clever, as there was no way that the Divisionists could assemble series of 15 paintings or more to capture their ‘moments’, given the painstaking technique required. Series were also a visible return to the core values of Impressionism, reinforcing its objective of capturing fleeting moments in time, something that Divisionism could not lay claim to. 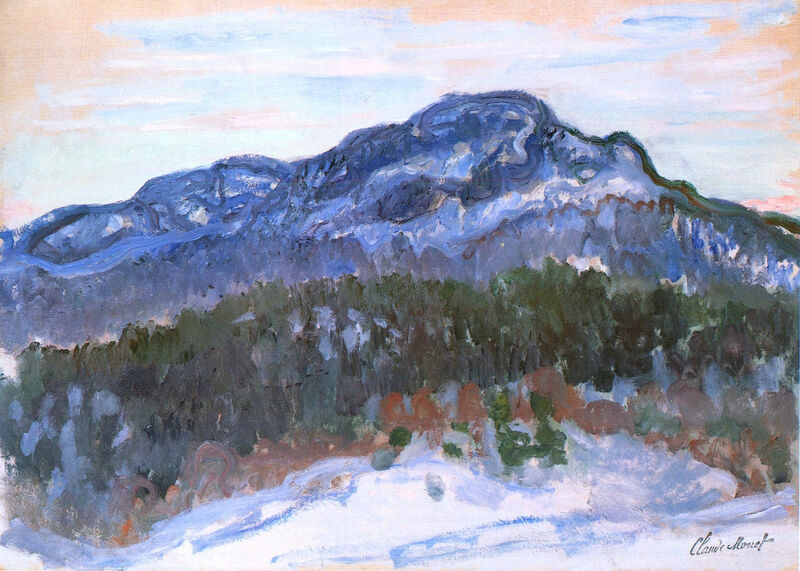 Claude Monet, Mont Kolsaas (1895) W1407, oil on canvas, 65 x 92 cm, Private collection. WikiArt. However his working methods had become anything but brisk. Instead of taking just a few weeks plein air to paint 15 Grainstacks, as he might have done in the 1880s, it took him more than 6 months, during which he manipulated their market to ensure strong sales when they were ready. Claude Monet, Bras de Seine près de Giverny à l’aurore (1897) W1479, oil on canvas, 81 x 92 cm, Hiroshima Museum of Art, Japan. WikiArt. Looking at those paintings, whilst they may well have been started plein air, there had been a sustained studio phase for each, with layers of wet-on-dry, not the wet-on-wet characteristic of the rapid work in front of the motif which is portrayed in the Grainstacks myth. 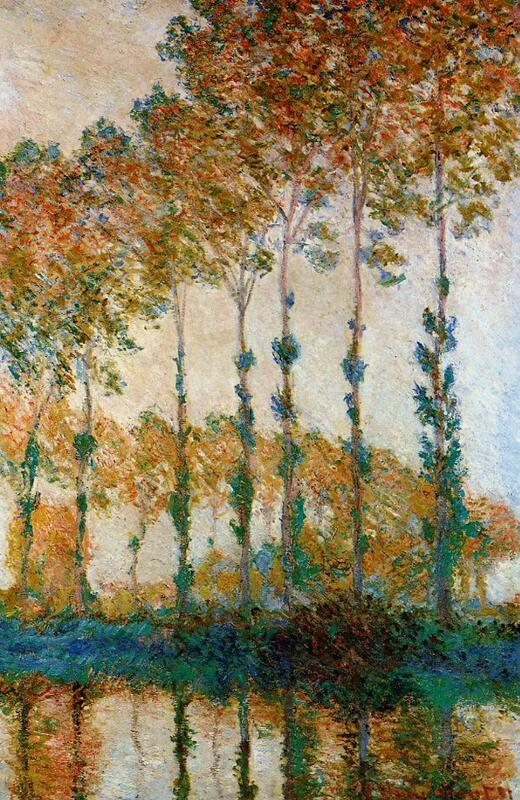 Several have significant pentimenti where Monet adjusted their original composition. For Monet series made both artistic sense and were commercially ideal. He was able to explore the effects of light, colour, and his sensations, however instant or delayed, across a series of paintings with essentially simple motifs and compositions, in which figures were either small or absent altogether. 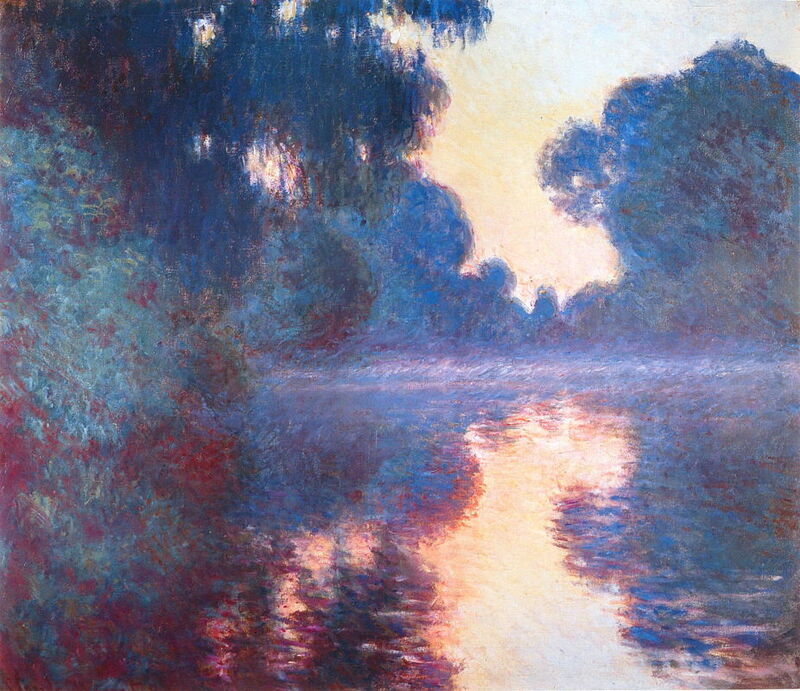 The aesthetics and interpretation of this have been explored by others in the overall context of Monet’s work. For his sales and repayment of the heavy investment made by Durand-Ruel and other dealers, they were honeypots. Effectively limited editions, most were snapped up briskly at excellent prices. It is worth noting that, whilst Pissarro was an enthusiastic printmaker, Monet confined himself to painting. The new collectors of Impressionist art, and of Monet’s work in particular, all wanted a chance to own a painting from his series, and were given the opportunity, for a price. Hence the paintings in each series have been dispersed across the globe, and are so seldom seen together as series, which defeats the artistic objective, of course. This completes my consideration of the individual painters and their series. In the next article I will try to make better sense of series painting, and whether it is a worthwhile enterprise for painters of today. Posted in Painting and tagged Durand-Ruel, grainstacks, Impressionism, landscape, Monet, Pissarro, Rouen Cathedral, series, Sisley. Bookmark the permalink.